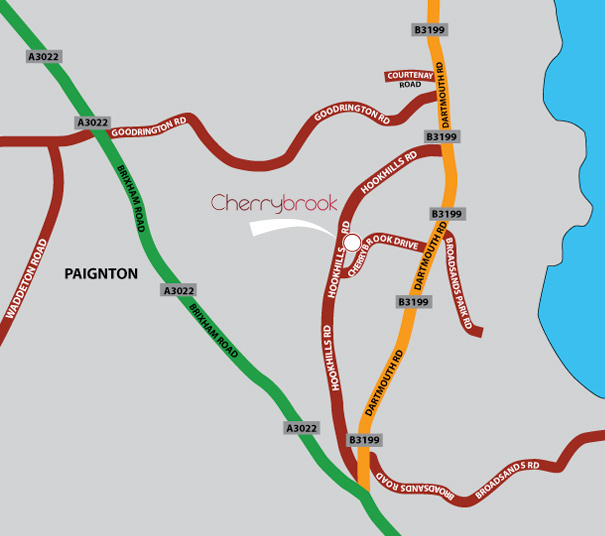 Cherrybrook (Hookhills Road) is situated in the Goodrington area about 2 miles south of Paignton town centre. The property lies between Cherrybrook Drive and Hookhills road. Immediately adjoining the neighbourhood shopping centre which offers a supermarket, chemist, general stores and hairdresser. Stores for other needs also complement the area. Continue on the A380 over further 2 roundabouts. At the crossroads, continue straight onto A3022/Brixham Road.